(Los Angeles) The duo Mitré, composed of Louis Mitré and Andie Sandóval, introduced new songs and old favorites at a BMI showcase sponsored by Peroni at the plush Continental Club in downtown Los Angeles Friday night. They were joined, as usual, by Hugo Melendez in his La Katarina persona, delighting the jam-packed room with his startlingly accurate costume and makeup by Ruben Lopez. While the new duo has appeared in several live events around Los Angles over the past few months, this was an official coming out party in a major club in both English and Spanish (all the songs were in Spanish but the conversations from the stage were bi-lingual). Louis Mitre has worked with a number of female singer-songwriters over the past year or so including Alih Jey and Irene Diaz, to add female color to his own astonishingly rich voice. 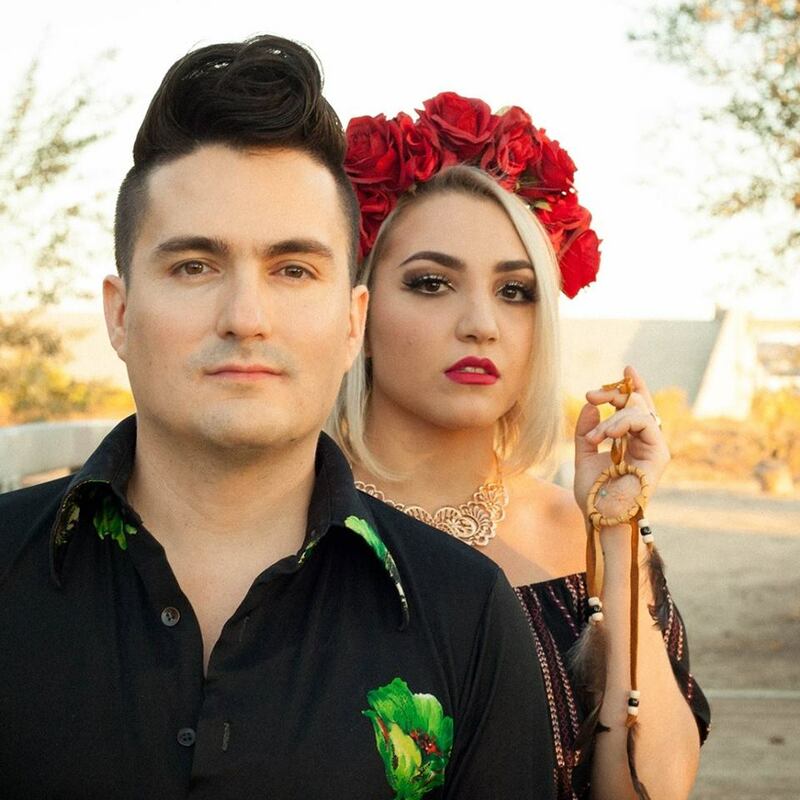 Andie Sandoval, a singer-songwriter originally from Sinaloa in Mexico seems to be the perfect complement, both in vocal range, songwriting and stage presence, hence the new duo. La Katrina returned to the stage with flowers and a swirling skirt for "Lloro", dramatizing the song’s namesake weeping spirit while Juan de Dios Martin joined them on the requinto. As Katarina swirled around them, Mitre and Andie’s voices harmonized, soared, and belted with a power that frankly overwhelmed the club’s temporary sound system. Louis reached and held his characteristic stratospheric notes and then came back down to earth in a guitar-requinto face-off with Martin as Andie picked up the song’s high altitude and turbocharged it even higher. Underscoring the harmonic point but dropping down to cruising altitude, Mitré wrapped the evening with an acapella version of “Perdon”, a perfect ending for the showcase.